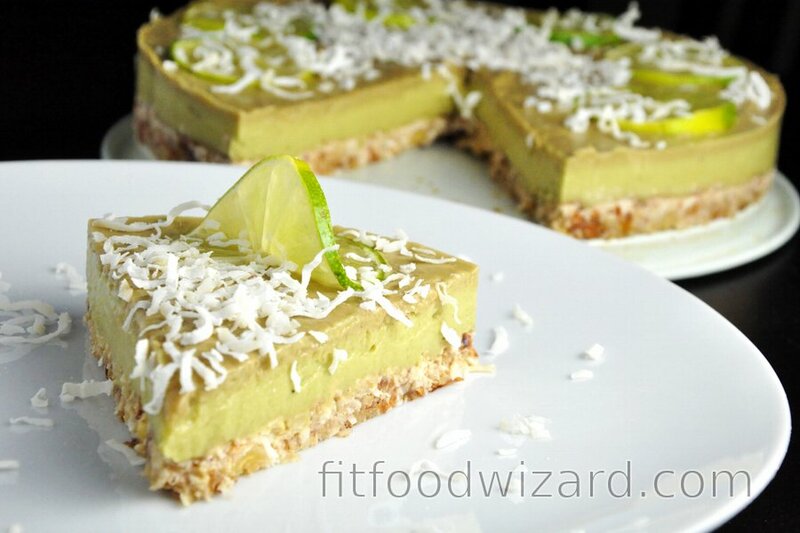 A refreshing raw lime-avocado cake is light, simple, sweet and sour, no-bake cake for any health-nut with a sweet tooth. This tasty and healthy raw cake is even suitable for vegans, if you switch honey for maple syrup. The recipe for this cake will also please the celiacs, because it is completely flourless and gluten-free. Avocado, the pear-shaped fruit, is recommended for everyone, especially for teenagers, people with anemia and diabetes, and future mommies (when the need for iron is higher). One of its advantages is its content of lecithin and copper - which is necessary for erythrocyte creation. It also contains a lot of vitamin B6, E, C, fiber, 60% more potassium than bananas, iron, magnesium, and phosphor. It positively affects muscle contraction and blood pressure, digestive and nervous system function, promotes a healthy prostate, balances blood sugar levels, and helps to keep an adequate blood cholesterol level. Avocado has anti-inflammatory effects, strengthens immunity, and increases resistance to infection. Nuts, dates, and coconut, forming the basis of the dough, are a great choice for nutritional and health-beneficial sweet cravings, that will not endanger your slim line. Healthy lime-avocado cake is a good substitute for a classic cake, where you will get the connection of fresh and sweet tones in one special cake by combining only healthy ingredients such as avocados, bananas, limes, and nuts-dates dough. In a blender, blend nuts, dates, and coconut. Press dough into the bottom of a cake pan and place into the refrigerator. Clean the blender and place the remaining ingredients for the lime-avocado mousse into a blender – avocados, bananas, sweetener, lime juice and peel - and blend thoroughly. After blending, taste mousse, and if desired, add either more lime juice or sweetener (depending on if you want to have a sweeter or more sour cake). When desired mousse taste is achieved, pour onto the dough. Place the cake in the refrigerator overnight, or for at least 8 hours. Before serving, you can decorate with lime and shredded coconut.